Demonstrators during the Women's March on Washington in January 2017. Rosa Pineda/Wikimedia Commons. CC BY-SA 4.0. 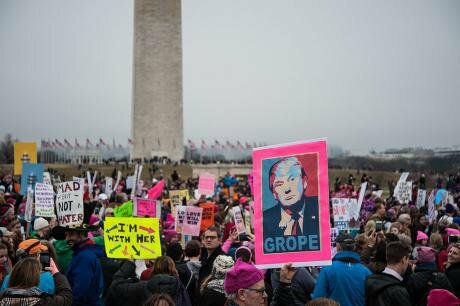 Some rights reserved.On 21 January 2017, Trump’s first full day in office, millions gathered in Washington DC, and around the world, to join the Women’s March. It was the first mass social movement response to Donald Trump’s election – and it was initiated, organised and led by women. "It was going to be women and it took women to show the rest of the world what collective solidarity is." Trump regularly made sexist comments about his opponent Hillary Clinton, but she was not the only woman he attacked during the course of his muddy campaign. Journalist Megyn Kelly, Republican candidate Carly Fiorina and actress Meryl Streep were also targets. 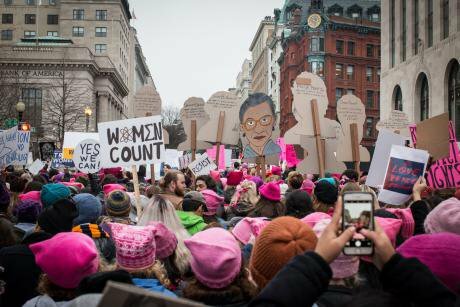 Women in particular were inspired to protest against Trump, in “fear that his administration would roll back women’s gains,” according to researchers Amanda Murdie and Dursun Pekson, who have studied more than 50,000 protests around the world since 1990. Their research found that women are more likely to take the streets where governments don’t recognise or don’t enforce their rights. “Many of us felt a deep connection to one another without actually knowing one another, and felt that it was important that we gave women a platform to organise, to march and to stand in solidarity with one another,” Perez said. Outrage and fear sparked by Trump pushed different groups to unite and organise. According to Perez, because the Women’s March touched on a wide variety of social issues, many people, particularly Caucasian men, tried to push organisers to call it “the People’s March”. But they resisted. “We needed something for ourselves, to unite us as women,” she said. “We needed something for ourselves, to unite us as women." Calling it the Women’s March also was important to highlight and encourage female leadership, Perez added. “In the US, we’ve had many social justice movements... led by men. A lot of women have participated in those movements, however their work has never been recognised”. The protest’s name attempted to rectify some of this erasure of women that researcher Christina Greene also found in her research into gender and participation in the civil rights movement. “Although few people… know their names, scores of women – especially African American women – participated on all levels of the modern black freedom movement: as leaders, grassroots activists, strategists, and theorists,” Greene has explained. Perez told me: “We thought it was important to allow women to take a stand and to become visible”. Key to the march’s success, she insists, was its intention to be intersectional and inclusive, though organisers did face criticism from some women of colour. This quote, repeated by Palestinian-American activist Linda Sarsour whilst campaigning against police brutality in New York, reflected the march’s approach, said Perez. Sarsour is another co-chair of the movement. Last year’s Women’s March was about “making sure that people saw visibility in our collective power,” Perez said. What was a collective moment of protest against Trump, and what he represents, has thus become an organised political movement. And women are, again, leading the way.